First Women Bank Limited, a scheduled commercial Bank requires energetic, career oriented and motivated individuals for Multiple Positions Jobs In All Pakistan to join its progressive team preferably women for the following positions with special quota for disabled, minorities and candidates holding Baluchistan domicile. Qualification:Graduate / Postgraduate preferably in Human Resource Management. Minimum 12 – 15 years of experience in Human Resources, of which 5 years should have been in senior management roles. Familiarity and skill with the tools of the trade in human resources including Organization Development, Talent Acquisition, Reward Management Loan Administration & HRIS. Qualification:Graduate preferably B.Com / Postgraduate degree preferably in Business / Banking or equivalent from an HEC recognized university. Minimum 12-15 years of experience in financial institution or related sectors, of which 5-8 years should have been in senior management roles. Skills: Post requires an extensive knowledge of SBP prudential regulations and other regulatory requirements, conversant with Bank’s environment of best practices & market norm of Business Development, proven track record of driving business strategies. Customer centric with extensive experience in Liabilities, Portfolio Management, Alliances & Sales Management with hands on experience of managing liability portfolio in a Commercial Bank. Qualification:Postgraduate degree preferably MBA, from a HEC recognized university.10– 12 years of Consumer Banking experience in Consumer Risk & Business Management. Knowledge of Core Banking, SBP Prudential Regulations, Credit Policies, Procedures and Risk Management Practices. Good managerial and communication skills as well as proficiency in MS Office/ related software’s. Qualification: Postgraduate preferably in Commerce or MBA/ ACCA/ CIMA/ CA finalist or articles completed. Minimum 5 to 8 years of banking experience with atleast 2 years of bank auditing experience. The ideal candidate should be well conversant with the SBP’s Prudential Regulations, prevalent banking & audit practices. Qualification: Masters or Bachelors Degree (16 years) in Computer Science/ Computer Systems / Computer Engineering / Management Information System or equivalent from HEC recognized institutions or from any reputable foreign university. Candidates having certification in CCISO, CISSP, CISM, CISA, CEH or OSCP will be preferred. Minimum 8 years relevant experience of which 3 years in the area of Information Security. Qualification: Graduate/ Postgraduate degree preferably M.Com / MBA in Marketing, Finance or Economics or equivalent from an HEC recognized university. 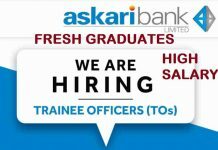 Minimum 5-7 years experience in Branch Operational Banking. Acquainted with updated banking & prudential regulations, branch banking controls, banking practices and procedures. 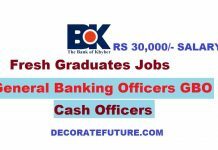 Qualification: Graduate preferably B.Com/ Postgraduate degree preferably M.Com / MBA in Marketing, Finance or Economics or equivalent from an HEC recognized university with minimum 3-5 years of experience of Branch Banking Operations with reputable Bank(s). Qualification:Graduate preferably B.Com /BBA, Postgraduate preferably MBA in Finance / ACCA. Fresh candidates should apply, preference will be given to those having 2-3 years relevant experience. Should have strong analytical skills. Expert in Ms Office specially Ms Excel spreadsheet for various types of analytical reporting. Qualification:Graduate preferably B.Com / Postgraduate degree preferably M.Com / MBA in Marketing, Finance or Economics or equivalent from an HEC recognized university. Fresh candidates should apply, preference will be given to those having a minimum of 2-3 years of experience in cash handling with any Commercial Bank/ DFI. To apply for banking jobs in First Women Bank Pakistan, fill the online application form by clicking the Apply Now.